It’s often said that we take the places we live in for granted. How often have we gone on our travels and completed walking tours, discovering hidden lane-ways with their secrets exposed as we ooh-ed and ahh-ed over what we deemed as fascinating overseas. The grass is greener, blah blah blah. 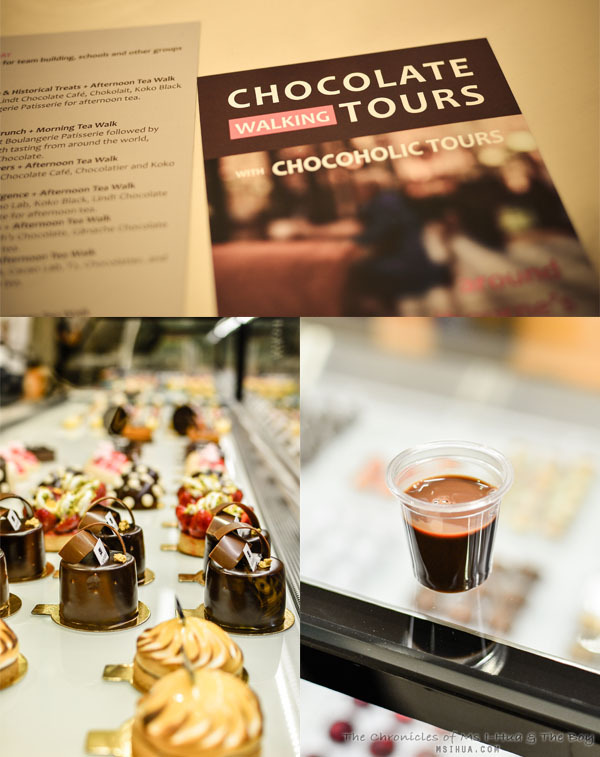 So it was with a determined heart, whilst on our recent travels to America when we received an invite that simply read, “Chocolate Walking Tours!” run by the lovely people at Chocoholic Tours. So we graciously accepted the invite and turned up on a rare sunny winter Sunday when we arrived back in Melbourne. The Chocoholic we chose to partake in was for a Sunday Chocolate Taste Walk which began at 12pm. 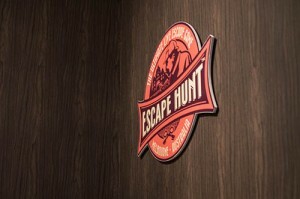 Guests were asked to meet at Cacao Lab (next to Emporium) before the group would depart on a nearly 2 hour walk around the city. 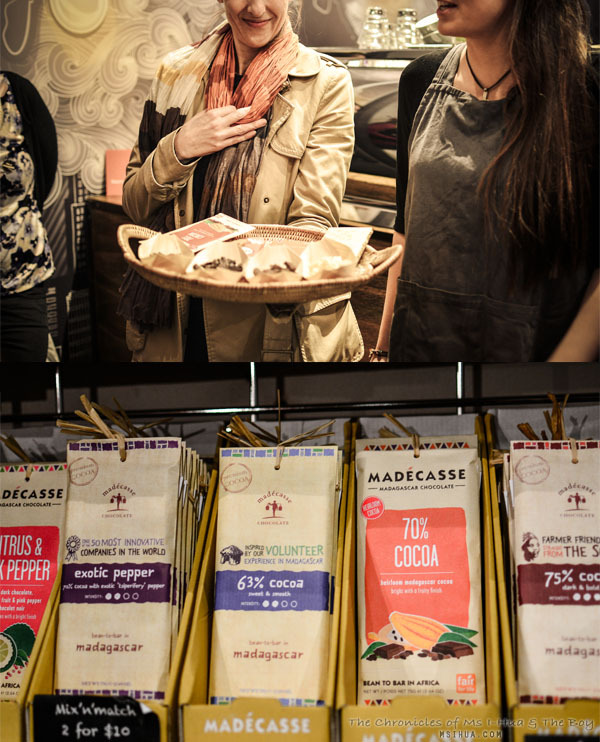 The tour which we joined consisted of 20 other chocolate addicts eagerly awaiting to taste and sample some of the city’s finest chocolates. At Cacao Lab, we sampled the classic Cacao of milk chocolate praline with crispy rice puffs encased in white chocolate before moving on for some liquid chocolate tasting. On samples were pots of Salted Caramel, Milk, Dark and Chilli Chocolate! From Cacao, we cut across bustling Bourke Street Mall, hopping along to the local buskers at play (man, they are getting awesome these days) and strolled into the beautiful Royal Arcade, which incidentally is my favourite building to take tourists to when they visit. Home to Koko Black’s flagship store, the Royal Arcade (opened in 1870), lends a certain atmospheric charm to the Belgian inspired Koko Black lounge. 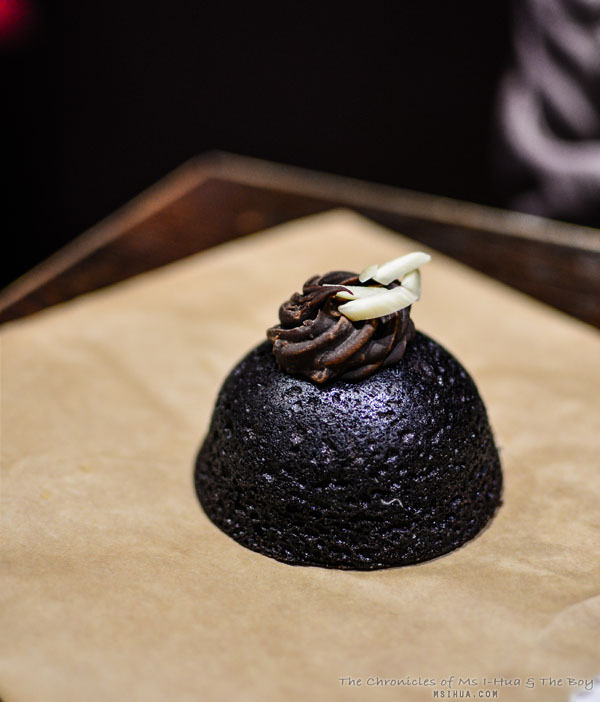 Here we sampled the classic Koko Black chocolate with raspberry filling and each received a complimentary drink voucher when we next come back and dine. After Koko Black, it was another short stroll up Swanston Street towards Swanston Walk (entrance of Mercure Hotel), where we sampled more chocolate goodies and played chocolate trivia! One of my favourite go-to places (as I work very close to their Rialto branch) to buy chocolates. Indeed not a day goes by that my team at work does not munch on a bag of Haighs. 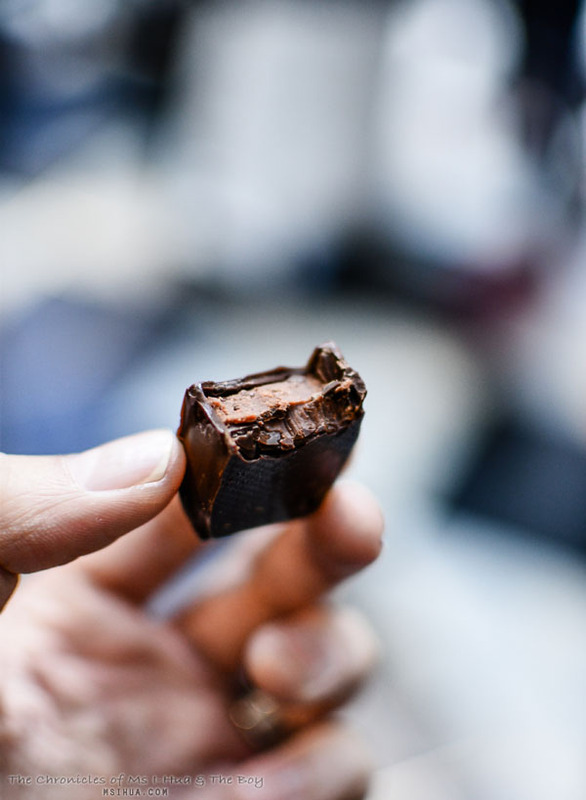 As the oldest family-owned chocolate retailer in Australia, it certainly is a must visit! 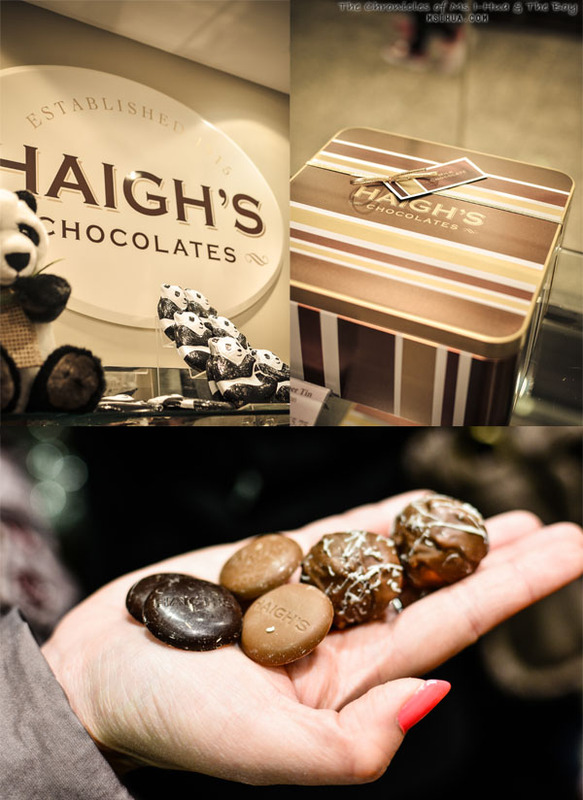 You can read more about Haigh’s Chocolates from our previous post. This little espresso bar tucked away in a hidden corner between the two buildings of Melbourne Central was certainly the highlight for me. I loved everything it stood for and I loved how passionate the staff were when talking about Fair Trading and how a little goes a long way in helping communities in need around the world. 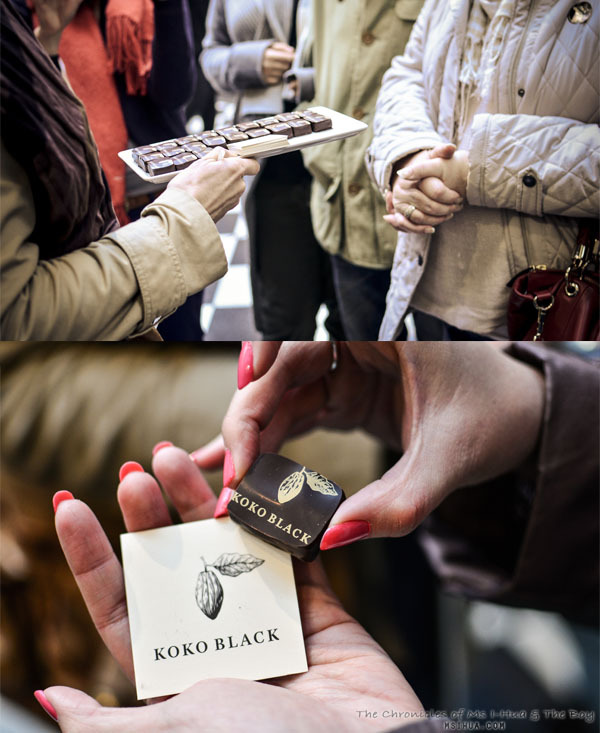 The final stop for the group was at Theobrama Chocolate Lounge at Melbourne Central. 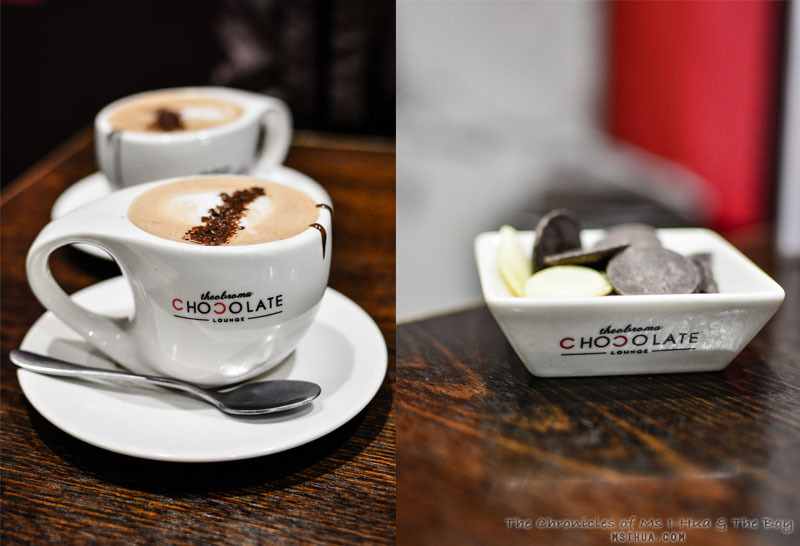 As we sat down on the soft comfy chairs, we ordered a hot mocha each, sampled more chocolate available at our tables and a flourless chocolate cake – all part of the tour! So not quite sure what to do on a free weekend coming? How about taking a look at Melbourne with a different set of eyes? Are you a fan of chocolate? 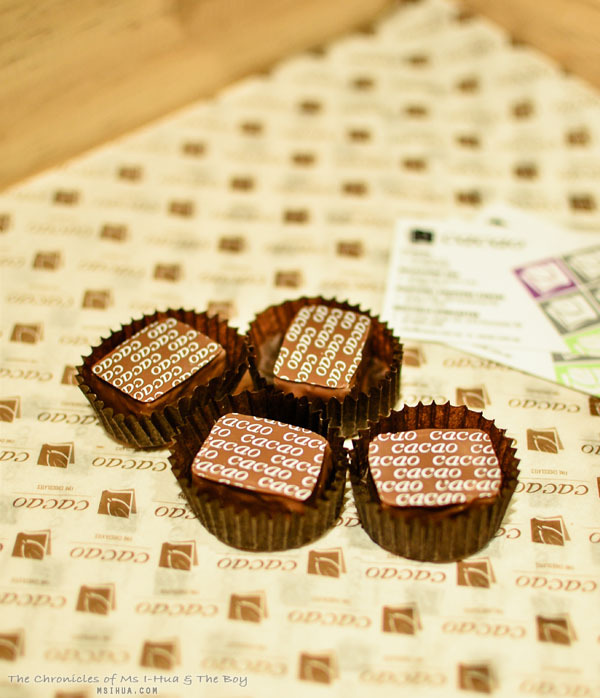 If so, go on to the Chocoholic Tours website now and find a Chocolate Walking tour that suites you! Thanks for the low down. I’m always trying to find some dessert places in the city and I’m going to try the last two! That is so true! I saw far more of Melbourne before I moved here. This looks like a fun tour. Time to get back into “touring” Melbourne. Do the Open House this weekend! Ohhh nice!! And they’re all in the city too. Often times, I do hear people tell me how good we have it here even after they’ve had an amazing trip overseas. Never travelled enough to know but I’m sure they’re onto something! You need to travel more Wince! lol chocolate salad sounds like my kinda chocolate! Chocolate salad is definitely a win! We did one of these for my cousin’s bridal shower a few years ago, it was great to see parts of the city (even the non-chocolate side) through the eyes of a tourist. Sadly 2Pocket wasn’t there at the time but I’ll have to look them up next time I’m in town, love the concept! Twopocket definitely worth a visit. I need to head back there soon! Hahaha! Thank you 🙂 It sure does make one crave for choccies! Arts Centre Melbourne Winter Series, Botanica & Double Pass Giveaway!